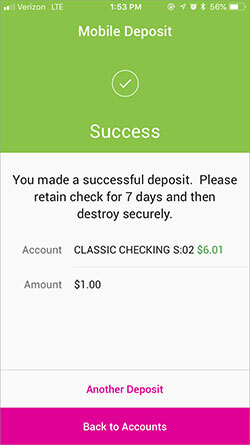 Step by Step Instructions for Making a Mobile Deposit. 1 Click on Mobile Deposit. 2OR, the quick menu on the bottom right. 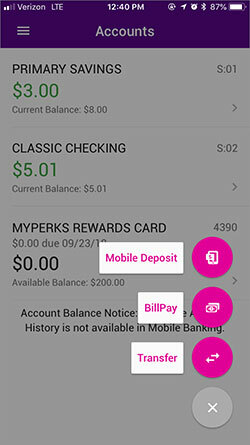 3This will load the Mobile Deposit page. 5 Enter the total amount on the check to be deposited by tapping on the $0.00. 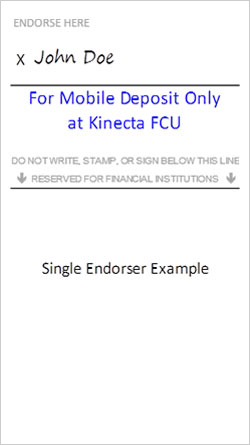 6As indicated by the text at the bottom of the page, beneath your signature/endorsement on the back of the check, please write: “For mobile deposit only at Kinecta FCU.” If a check does not include this additional language it may be rejected. 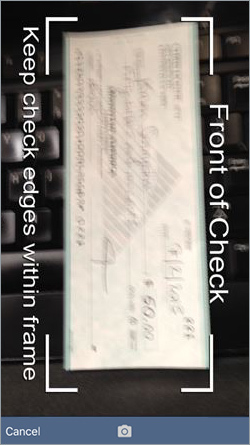 7 Click on the Check Front button to take a picture of the front of your check. This loads the camera interface. 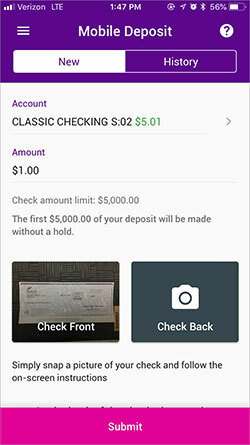 The check should be steady and aligned within the guided borders of the interface. Tap the camera icon on the right-hand side to take the picture or "Cancel" to stop. 8 After you take the picture, a thumbnail of it will display in the Mobile Deposit page. 9 Next step, click on the Check Back button to take the second picture. 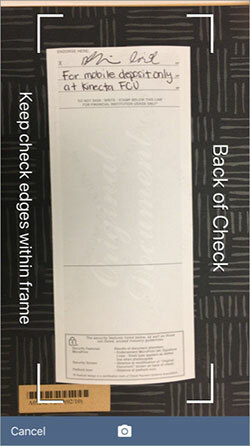 NOTE: The back of the check must be endorsed, and the signature unobstructed within the predefined area. Again, make sure to position it according to the displayed guidelines. This is a good example of properly aligning the check image within the guidelines. Tap on either of the image thumbnails to return to the camera and re-take that particular picture. 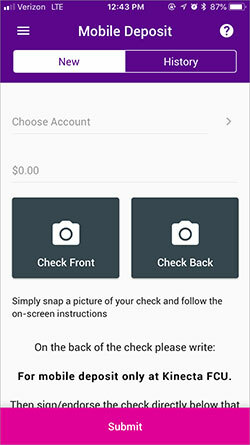 Tap on the “Amount” field to return to the keypad if the amount entered doesn’t match the amount on the check. The check processing system will detect a mismatch between the amount on the check and the amount entered in the application – and will reject the deposit attempt. NOTE the Terms and Conditions hyperlink above the Submit button. 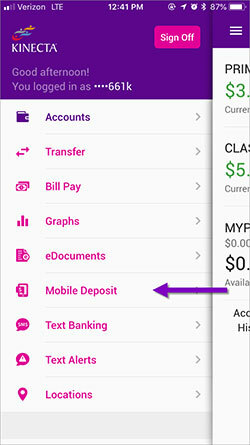 Press on the hyperlink in order to load the Terms and Conditions specific to Mobile Deposit use. The data you entered for your deposit will NOT be lost by opening this link. Click Submit to deposit your check. 11 To confirm your deposit - verify the information and click Confirm. 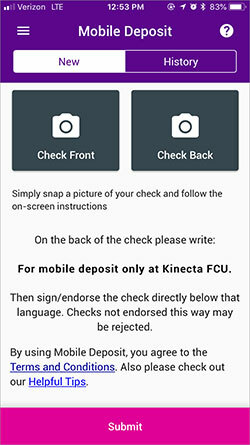 12 If the check images and deposit information pass validation, you will receive a notice of your successful deposit. 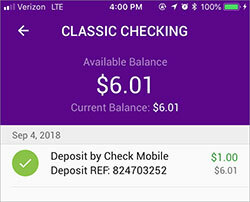 *Please retain your check per the instructions on the screen, and login to your account periodically to ensure that your deposit has been approved. 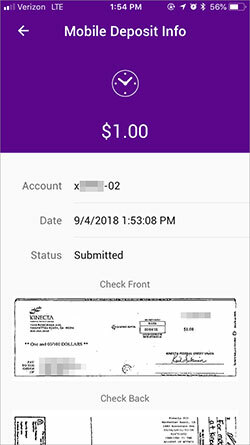 Click on "Back to Accounts" to see all of your transactions on each account, OR "Another Deposit" to deposit another check. To see a list of your deposits in process - Click on "Another Deposit". 13 To see a list of all deposits made to all your accounts, and their respective status, click on the "History" tab menu at the top of the main Mobile Deposit page. 14 You can click on each item to see the details and the image of the check. 15 To exit, click on the arrow at the top left corner of the page. Then click on the Main Menu icon at the top left corner of the page. Click on "Accounts" to see the summary or balance of all your accounts. 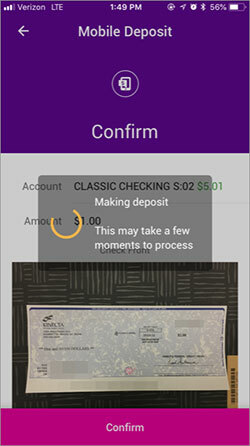 Click on the destination account on your check to verify the deposit has been made successfully.